A Unique and Rare find. "Watia Creekside" Retreat will exceed all of your expectations, and is sure to spoil you for all others. When only the Finest Accommodations will do, - Watia Creekside Retreat is the place for you... to rejuvenate after a day Exploring the endless attractions this area has to offer! 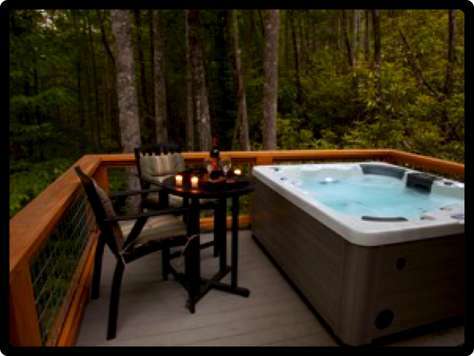 Let the Soothing Sounds of the Creek surround You as you Enjoy a soak in the Sparkling Hot Tub. (Offering easily accessible access roads, 4 WD is not necessary). Tranquility, Serenity, and Quietude... All words to describe the calmness you experience while standing on the deck listening to the sounds of the Creek below or relaxing in the outdoor living area. The outdoor Fireplace provides a gentle warmth as you relax, wrapped in one of our Plush Bathrobes, after a relaxing soak in the hot tub. If you prefer a wood burning fire, the Rock Fire Pit is along side the Creek, and the wood rack is stocked. Inside the Cabin you will find the stainless and granite "Chef's Kitchen" is well stocked with everything you need to prepare your meals. Upstairs, the loft was designed for entertaining with a Foosball table, Flat Screen Satellite TV, 3rd full bathroom, and another Living Area (this sofa converts to a bed and foam topper is provided). If you must work, you will appreciate the Business Center, High Speed Internet (WiFi), and a "Land Line" Telephone (long distance through out the U.S.A. is complimentary). You have Private access to Fontana Lake front, just a few short minutes away. Here you will enjoy the swim platform, 9 boat slips, and great fishing so bring your pole. Fontana Lake is home to every freshwater species of fish (including Waleye). 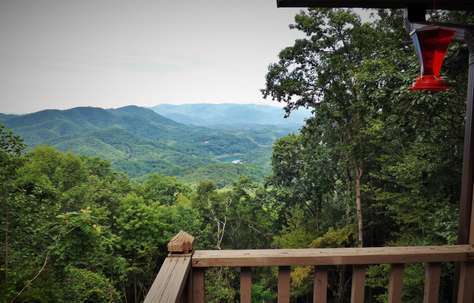 This Exclusive Location offers a Private back road that leads to the Nantahala Outdoor Center (N.O.C.). Along this road you will encounter a Scenic Deck that overlooks Lake Fontana and Amazing Views of the Mountains beyond, Over 7 miles of Biking Trails, and a short Hiking Trail that leads to a Spectacular 50 foot Waterfall! As a Guest at Watia Creekside, the Amenities at the NOC are yours to enjoy (Both Public and Private). This includes: Whitewater Rafting, Kayaking, Horseback Riding, Fly Fishing (lessons, poles, and bait available), Tennis Courts, Bike Rentals, Miles of Mountain Biking trails, Rope Course, Zip Lines, Outfitter Store, 3 Restaurants (from casual outdoor Riverfront to Fine Dining), Live Entertainment (seasonal), and even a "Tree Top Playground" for the lil ones. There truly is something for everyone at this outdoor mecca! The Tsali Recreation Center is just 10 minutes up the road, so bring the mountain bikes. 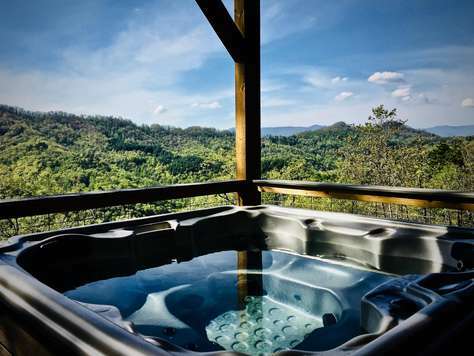 Cherokee, Harrah's Casino, and the Great Smoky Mountain National Park is just 20 - 30 minutes away. ... If your vacation dates are during 'Season' or Holidays and you plan to rent a pontoon or fishing boat, it may be a good idea to reserve in advance. Lake Fontana is primarily National Forest, Smoky Mountains, and Federally owned, so the Lake is never 'Busy', but the few available rental boats do get booked up. "Watia Creekside" is sure to be your favorite Mountain Retreat! "Mountain Time" (at Sky Cove) has been Newly Renovated, Tastefully Updated, and is available for your enjoyment! Luxury Amenities, Designer appointments throughout, Just 10 minutes from downtown Bryson City, yet the Cabin offers an "Away from it all" Feeling! As you arrive, you will drive up a paved mountain road, and will pass a few other cabins along the way. “Mountain Time” is at the end of a short side road, and sits on a “Knoll”, surrounded by Nature. The kitchen, dining room and main level living spaces flow together for a roomy, light, and open floor plan with plenty of windows, and a complete wall of glass that emphasizes the Stunning Mountain Views. Solid surface countertops in the kitchen provide ample space for preparation and cooking. Additionally, the kitchen is well stocked with everything you will need to prepare and serve your home cooked meals. For the Chef in the Family, Grilling out has never been this "View-licious"! The living space has soaring ceilings, a stone gas log fireplace, unique Designer décor, luxurious furniture and a 50 inch flat screen HDTV. Just a few steps from the kitchen is the main level’s full bathroom with ceramic tile, and a jetted tub. The laundry room offers a full size washing machine and dryer. Kick back in one of the rocking chairs and enjoy your coffee as the fog lifts from the endless rolling mountains each morning. Immediately adjacent is the gas grill. The porch provides plenty of seating and space for enjoying Nature, Dining Al Fresco, and grilling with friends and family. Come back inside to explore the rest of the cabin including the main level bedroom which offers a very comfortable and luxurious queen size bed (new in late 2017). Ready for a game shuffleboard? Head downstairs to the game table in the main living space area. This shuffleboard table is bound to provide hours of Fun and Entertainment for the entire Family! Whether you are here to explore the numerous scenic drives, or to Kayak, go White water rafting, Zip lining, Tubing, Mountain Biking, Boating on Fontana Lake, Hike the trails, and more... "Mountain Time - At Sky Cove" will make you feel at home, and keep you coming back again and again! View the new area Guide on our website for links and additional information about the area and activities. For larger groups: We offer two other cabins on the same Mountain Top. Combined, these 3 cabins can accomodate up to 16 Guests! Bring your fishing poles, your dinner is swimming just a few feet away from the covered deck! For those of you that do need to work, wireless internet is unlimited, and is complimentary. 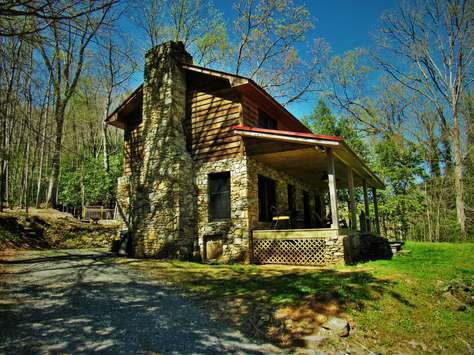 This unique log - two bedroom two bath mountain cabin retreat is located in a very private setting, with Alarka Creek right in the back yard. Oak hardwood floors, wood interior and vaulted ceilings add to the mountain feel. There are two spacious and inviting bedrooms with Log Beds, that are locally handcrafted from native wood. (The second satellite TV is in the main level bedroom). In the great room living area there are large windows that let nature in no matter what the weather. You’ll be quite comfortable in the Open concept living room, and dining on a table handcrafted by a local artisan. The centerpiece of the living area is the stone fireplace topped with a 50 inch flat screen “smart” HDTV, that offers an upgraded Satellite system. In the main level master suite, there is a second flatscreen TV. Upstairs offers a second Master suite (both bedrooms offer queen beds, luxury linens and bedding). The full kitchen is equipped with stainless appliances and has plenty of space for preparing your meals. If you like to cook outside, the creekside BBQ grill is your spot! You can enjoy your meals at the log dining table or out back on the picnic table overlooking the creek. Enjoy the outdoors around this cabin with the Creek that is as wide and many rivers, and stocked with Brown, Brook, and Rainbow Trout! - Hatchery supported by the state of NC. Creekside you can wile away the afternoon fishing for your dinner, dine at the picnic table, or enjoy a campfire at the fire-pit in the evening. For Guest convenience, there is a full size stacked washer and dryer. Just 10 minutes from Bryson City, and within 20 minutes of The scenic train depot, white water rafting, deep creek tubing, kayaking, horseback riding, mountain biking at the Tsali, swimming and boating at Fontana Lake, shopping, dining at several restaurants, and so many more area activities! View the new area Guide on our website ncmountains.net for links and additional information about the area and activities. The road to "Shady Creek" is easily navigated without the need for 4WD, and is motorcycle friendly. Additionally, there are expansive front, side, and back yards, that are quite flat and user friendly, so bring your yard games. From the moment you enter the Great Room living area with it’s Soaring Ceilings and Walls of Glass, You won't be able to take your eyes off of the Spectacular and Panoramic Long Range Mountain Views. “Watia View” was Thoughtfully Built in 2018, and was Designed to enjoy Nature in Ultimate Comfort. The kitchen is fully stocked with everything you will need to prepare and serve your meals,and is well appointed with stainless steel appliances, Granite counter tops, and a large island with counter seating and an adjacent intimate dining area encased in windows. You will truly appreciate the wonderful atmosphere that is perfect for enjoying whatever you have planned... or inspiring great ideas! Truly a Unique Destination Vacation with easy access roads that do not require 4 WD. Upstairs… The master bedroom features a King Bed prepared with fine Linens, and a private “Romeo and Juliet” style balcony, and more Amazing Views. Continuing the luxurious mountain feel of this home, the second bedroom features a luxurious Queen bed, Stunning mountain views and a second "Romeo and Juliet" style balcony. The Loft offers another area to relax and enjoy the Views, and the sofa converts to a Queen bed. As beautiful as the interior of this cabin is, this one is all about the great outdoors! There are several covered decks, an Outdoor shower, and Sparkling hot tub. (2 Plush Bathrobes are provided). This wonderfully Private cabin is convenient to all of the outdoor activities offered at the Nantahala Outdoor Center, Fontana Lake, and beyond. If you are looking to reconnect with nature, this is the get-a-way experience for you. Just a short drive from the cabin is a Private Swim and Sun platform as well as several boat docks on Fontana Lake. You have a private and gated access road that connects you to the amenities at the N.O.C. (white water rafting, kayaking, paddle boarding, zip lines, several restaurants, rope course, out fitter store, a playground in the sky, and more)... Off this private road, are several miles of Biking Trails (The Flintridge Trails) and a short hike to view sensational water falls. We offer an optional grocery shopping service. We will shop for your groceries and supplies, and have them stored and ready for you when you arrive. As you drive to the Nantahala Gorge, you will experience a true vacation feeling! 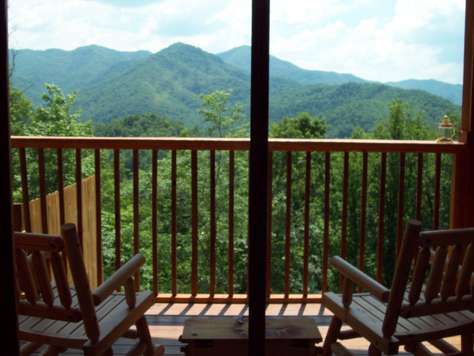 From the moment you see the Majestic Long Range Mountain Views from the Cabin, you are sure to be captivated! Inside the cabin there are wood floors, pine tongue and groove walls and a complete wall of glass w/ floor to ceiling windows to take in the Majestic Mountain Views from every room in the Cabin! The stainless & granite kitchen is well appointed with everything you need to cook at 'home' - and on the deck, a BBQ Grill. For those of you that enjoy hydro-therapy, there is a jetted tub in the downstairs bathroom. Bring the S'mores fixins and brush up on your favorite Campfire stories. Gathering around the FirePit is always an end of the day favorite! As always, the beds are prepared with Luxury linens and top quality Bedding. Now offering complimentary WiFi to our Guests, (for emailing and browsing the web). The N.O.C. is just 5 minutes up the road and it is one of the main reasons both Good Morning America and National Geographic voted this area '#1 Vacation with a Splash'! There are 7-8 restaurants within 10 minutes from casual to fine dining! There are a total of (3) Flat-screen TV's (each with an extensive satellite channel selection), WiFi, and a Foosball Table! The Tsali (for hiking and biking trails) and Fontana Lake are within 10 minutes. Bryson City (shopping, dining, the scenic train depot and more) are within 20 minutes. ... Shopping service. If you would like to arrive at the Cabin with your Groceries already stocked, ask for details, we will have everything waiting for you upon your arrival. ... If your vacation dates are during 'Season' or Holidays and you plan to rent a pontoon or fishing boat, it may be a good idea to reserve in advance. Lake Fontana and the shore line is primarily Nantahala National Forest, or is part of The Great Smoky Mountain National Park, which is Federally owned, so the Lake is never 'Busy', but the few available rental boats do get booked up. View the new area Guide for links and additional information about the area and activities. There is a hand drawn map inside the welcome book to show some of the trails. Mountain Magic is the perfect place to make your own Magical Mountain Memories! Relax and enjoy the incredible 180 degree views available from nearly every room of this LUXURY MOUNTAIN LODGE. 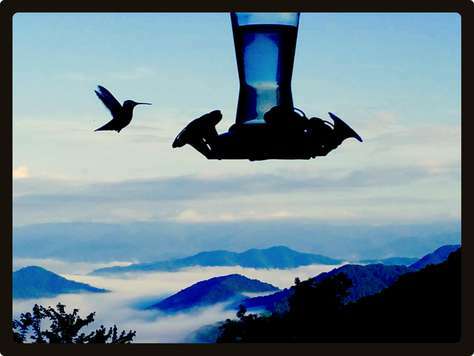 Watch as the Hawks soar over the Mountains from the comfort of the glass-walled great room, nearly every room in the Cabin, and the dramatic overlook decks. In the evenings, the Stars and Fireflies illuminate the Sky as you gather around the Fire-pit and roast Marshmallows making Magical Mountain Memories! The main floor features cathedral ceilings, hardwood floors, a gourmet kitchen with granite counter tops and modern appliances, a Guest suite with queen-size bed, a spacious Great Room with Stone fireplace and Leather Seating. The entertainment system in the great room features a 55-inch HD television with access to many satellite channels, and a DVD player. In the event of a rainy day you are sure to enjoy the new BluRay player, which is connected to the WiFi, and offers Netflix and Hulu! The downstairs area offers a Luxurious King size Bed, a full en-suite bathroom complete with a Jacuzzi tub/shower combination, a second stone fireplace which offers a very romantic ambience in the Master Bedroom, Satellite TV, and a sofa/seating area. The Hot Tub is located on a Private deck on this level. Additionally, 2 plush bathrobes are provided. In the loft, you will find a comfortable sofa, (which pulls out to a queen sofa bed with a memory foam mattress that was upgraded in 2018), a table for checkers and board games, Foosball table, and a Wii game system (perfect for those rainy days). Bring your laptop and stay in touch with the office and friends via the complimentary Wi-Fi internet. You will drive up the curvy Mountain and to the cabin on excellent Paved roads! (Large parking area is compacted gravel). We do offer two other Vacation Rental Cabins on that same Mountain, please keep us in mind for larger groups! These 3 cabins combined can sleep at least 16 Guests. 'Smoky Mountain Dawn' cabin is Ideally located within minutes of all the area shopping, dining, and Fun! Paved access roads that lead to cabins with such incredible Mountain Views are a rare find this close to town. This Upscale Rustic Modern Retreat is sure to make you feel like you are on top of the world! 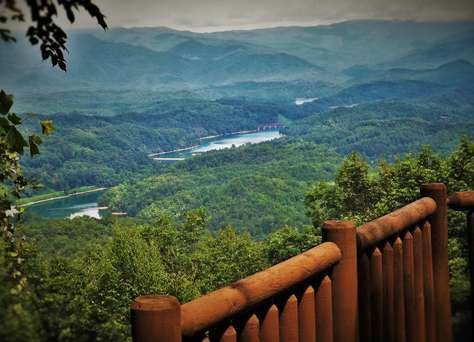 The Views of the Smoky Mountains will keep you coming back. The Living room offers soaring ceilings, and an open floor plan that is ideal for gathering, and a complete wall of glass to allow the Mountain Views and Nature surround you! There is a large bedroom with a flat screen TV on the main floor with a full bath across the hall. A second queen bed in the loft offers another full bath and a flat screen Satellite T.V. - The loft is set up as a Jr. Master Suite. The Master Bedroom is the entire lower level and offers a second fireplace for cozy evenings, a private lounge area, a third large flat screen satellite T.V., a balcony with access to the Hot Tub, and a large tiled shower for two (two shower heads) and is very Private and Romantic! Outside are several decks to choose where you would like to relax with a beverage and gaze out over the Mountain Views! When you turn off all the cabin lights, and look up, you will see so many more stars than you can imagine! The stars only competition are the fire flies in the summer time. Designer appointments can be found through out the cabin. The Cabin was completely remodeled, (including a completely new Kitchen and all 3 Bathrooms), just a few years ago. Long range mountain views like Smoky Mountain offers, just 10 minutes to Bryson City, Train Depot, Shopping, and Dining, are indeed a rare find! You will drive up the Mountain to the cabin on excellent Paved roads, that curve around and up to these Spectacular Long Rang Mountain Views. (Large parking area is compacted gravel). View the new area Guide on line for information about the area and activities. For larger groups, ask us about the other cabins we have in this area. Together, they can accomodate up to 16 Guests! 'Serenity Falls' is an Authentic Stone and Wood Cabin that will absolutely live up to it's name! Peaceful Serene setting is enhanced by the Babbling Creek that meanders through the length of the property and along side the Cabin, (2) Fire pits, Wood Burning Stone Fireplace and sparkling therapeutic Hot Tub! Outside you will enjoy the fire pit, sparkling hot tub, and large shady yard. The cabin is on 25 Acres of Beautiful Mountain Property, and there are Waterfalls that are a short, albeit rough, hike along the Creek! Inside there is a well appointed, and newly remodeled kitchen, that has everything you will need to prepare and serve your meals at the cabin. 2017 updates and upgrades include a dual grill which offers a choice of cooking with Gas (we provide a full tank of propane), or Charcoal (you provide your own charcoal and lighter fluid)! Additionally, As of July 2017, the carpeting upstairs in brand new, and the kitchen has been remodeled with upgraded counter tops, appliances and a dishwasher! In the living room are original wood floors, new living room furniture (sofa pulls out to make a queen bed), and a large flat screen TV. Upstairs is another bathroom, large bedroom with a King bed that is so comfortable, Guests don't want to go home, and a loft space that offers a twin day bed with a twin trundle in the closet. The cabin is ideally suited for 2 - 4 Guests. This location is very private, but is also very close to area restaurants, shopping, dining, the Great Smoky Mountain National Park, Cherokee, and Harrah's Casino. Within 10-15 minutes you can be in either Cherokee or Bryson City. Staying at this property which gleams with pride of ownership, and an owner that cares and regularly updates to keep things fresh, is a Joy! A few minutes up the road is 'Coopers Creek Trout Pond' which makes catching your dinner very easy and fun! At Coopers Creek Trout Farm, you will find access to 7-10 miles of hiking trails that are part of the Great Smoky Mountains! You can walk there from the cabin, or drive there, park your car, and explore the hiking trails! Within 15-20 minutes you can be tubing at Deep Creek (also beautiful waterfall hiking area), shopping in Bryson City, or in the Great Smoky Mountains! This Cabin is sure to be your favorite Mountain Cabin for years to come! Serenity Falls is close to the half way point between Bryson City and Cherokee. When you want it all, "Royal Views" is cabin for you. This cabin's name says it all… Located in the heart of the highly desirable Glory Mountain Area, Royal Views blissful setting overlooks the idyllic scenery of the Great Smoky Mountains and Fontana Lake, framed by miles of both short, and long-range mountain and Lake views. The Cabin itself is as equally wonderful as its setting. Comfortably sleeping up to 4, this spacious and open, custom-built, log cabin offers enormous decks with plentiful seating including rockers, a large square log picnic table. Here, after a day of mountain and lake activities, all of your guests can reunite and continue to experience their vacation from the most comfortable vantage point. Enjoy the views and fresh air while watching for native birds around the property’s blossoming rhodadendrons and hummingbird bushes. "Royal Views Cabin also has a fantastic outdoor area, tastefully landscaped and terraced offering several areas of useable space. While relaxing on the expansive deck, listen for the sounds of the scenic train as it Choo Choo's across the bridge and over the Lake, on it's way between Bryson City and the N.O.C. Indoors, Royal Views takes full advantage of every vista with plenty of picture windows and an impressive wall of glass in the great room. The open floor plan is spacious but exudes warmth and coziness thanks to the large roaring fireplace and thoughtfully chosen, well-appointed, premium furnishings and décor. Here, rustic elegance is the look, and total comfort is the feel. In the event you may need to stay connected, browse the internet, and email everyone to let them know how much you are enjoying yourselves, Royal Views now offers WiFi! Continuing on the main level you’ll find a kitchen that has everything the aspiring chef needs. With a breakfast bar big enough for several people, there’s plenty of room for Guests to gather round. Adjacent to this area is even more seating with a dining table accommodating six. The master bedroom is just off of the main living area and has its own private bathroom, comfortable king bed, and TV. The queen bedroom is on the opposite end of the cabin offering complete privacy, adjacent full bathroom, luxury linens, satellite TV, and is ideal for 2 couples. Royal Views will make it easy to leave the daily stress of life behind. It has all that you’ll need to make your vacation memorable and provides all of the simple, peaceful pleasures to help you connect with nature and reconnect with family and friends. For additional Guests, please ask about nearby "Majestic Overlook", a romantic Honeymoon cabin that sleeps 2 Guests. Whether you are looking for a Vacation Cabin to unwind at the end of an active day outdoors, or you just want Peaceful Privacy and Relaxation, "Paddlers Retreat" is ideally located between Bryson City, the Tsali, and the N.O.C! Inside the cabin you will find a well appointed kitchen with everything you require to prepare and serve your meals. The open and spacious floor plan is ideal for entertaining and relaxation. In the Living Room, the Stone fireplace is the focal point! For your entertainment, there are 3 flat screen TV's with satellite channels included. In the living room, there is a DVD player, assorted board and card games, and in the event of a rainy day, there is a Wii Game System. The split floor plan does offer abundant privacy between the two bedrooms! On one side of the cabin, there is the Master Bedroom with King size bed (luxury linens and bedding are provided) and a private en suite bathroom. On the opposite side of the cabin, you will enjoy a "Jr. Master Suite" with a second King size bed, and an adjoining full bathroom. Each bedroom offers a 32" flat screen television with an extensive selection of satellite Channels to choose from. 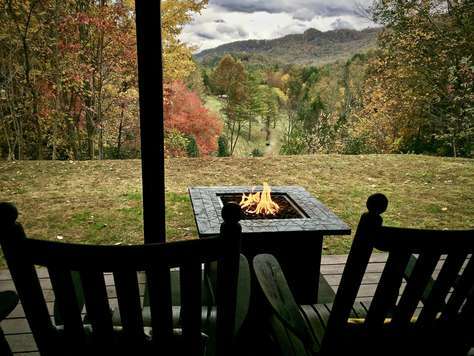 The covered back deck offers several rocking chairs to relax and gather around the Fire Pit, enjoy a soak in the Sparkling hot tub, and Enjoy the ever changing beauty of the Smoky Mountains! ...In 2017, the Private Nature Trail was upgraded and meanders through the back acreage, and leads to a lovely flat area beside a Mountain Stream that is covered by a canopy of shade trees. It is quite relaxing to just take a walk in the woods, and the Nature trail is sure to be a hit with 2 and 4 legged Guests alike! For the more adventurous hikers, there are trails (off the property and over US Forest Service land), that lead to Lake Fontana and within 2 miles of the Appalachian Trail! ...In 2018, we added a brand new Fire Pit on the covered view deck (enough fuel to get you started is provided). Additionally, the cabin now offers complimentary high speed Internet/WiFi! Getting to the Cabin: Access to this private retreat is easy. Paddlers Retreat is located just over a mile from the main highway which is far enough to enjoy Peace and Quiet without "road noise" (it is so quiet, you could hear a pin drop). The road is not narrow or steep, and you do not feel as though you are "climbing the Mountain". Close enough to easily arrive at all the area activities quickly and without excess time in your car. Ideally located between the Nantahala Outdoor Center and the Tsali Recreation and Mountain Biking Park, and Bryson City is less than 15 minutes away! "Paddlers Retreat" is nestled into over 7 acres that offer more than just Peaceful Seclusion! There are several hiking trails in and around the property. One of the trails leads you to a quaint little Stream where the property flattens out and is under a thick canopy of shade trees! This cabin is a haven for wild life sightings! While you are watching the Cows graze in a neighboring Pasture, you may see Deer & Wild Turkey too! Inside the cabin, warm wood surrounds you, and floor to ceiling glass brings in the Stunning Views! The kitchen offers upscale Stainless Steel appliances, Granite counter tops, and is well stocked with everything you will need to prepare and serve your meals! Outside and facing the View is a covered Deck to relax and enjoy Nature, the Mountains, and Lake Fontana. In the distance, you will see the Bryson City Scenic Railway Trustle and even the faint sound of the Choo Choo, as it passes from time to time. 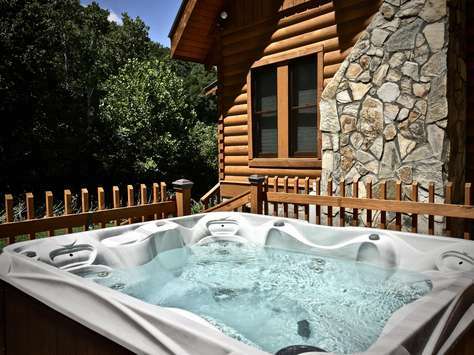 Additionally, there is a Large Private open deck on the side of the cabin, which is home to the very Private and Sparkling Hot Tub, Upscale Propane Fire-Pit, and a few Chairs to relax after a soak in the Hot Tub (Plush Bathrobes are provided). In the event you may need to stay connected, browse the internet, and email everyone to let them know how much you are enjoying yourselves, Majestic Overlook now offers high speed WiFi! Conveniently Located within 20 minutes of the N.O.C., Bryson City, Lake Fontana, Shopping and Dining! “Majestic Overlook" is technically the Guest house of another cabin (Royal Views), but does offer ample Privacy! 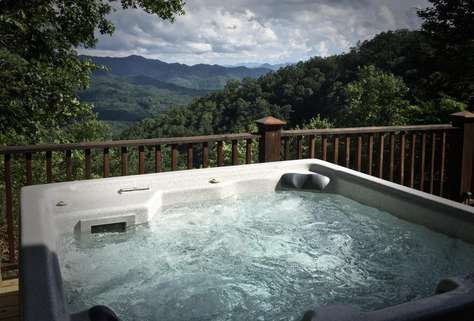 You will not see the other cabin from anywhere in "Majestic Overlook", nor from the covered deck, and not even from the side deck where your private hot tub is located! You will have your Peaceful Privacy, but if you are looking for complete seclusion, this may not be the cabin for you. 4 WD is NOT required, unless there are severe weather conditions (cabin is closed Jan. and Feb.).